The April ranking shows Cassandra climbing to the 9th place by overtaking SAP’s Sybase Adaptive Server Enterprise (ASE). This is the highest position Cassandra ever had in the DB-Engines ranking. As a consequence it continues to head the Wide-Column-Store segment with Apache’s HBase and Accumulo being next. Oracle, MySQL and Microsoft SQL Server continue to dominate the ranking. MongoDB steadily improves its score and is the leading NoSQL system. 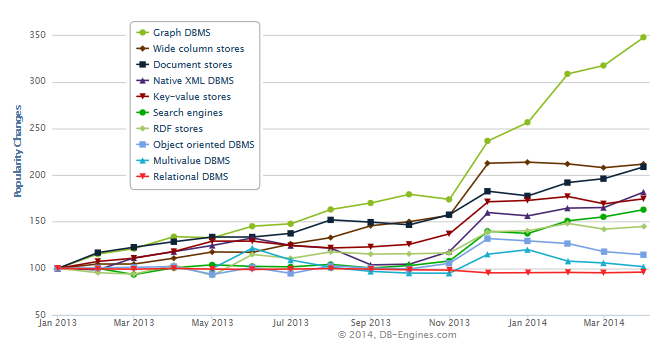 The ranking of database categories impressively shows the growing demand for managing graph oriented data. The above chart shows the relative increase in popularity compared to January 2013. However, we must not forget that Graph DBMS currently account for only 0,4% of all popularity points, whereas relational systems account for 87,7%. (Find additional details here.) Nevertheless, it will be interesting to watch how the big players deal with that trend in future.